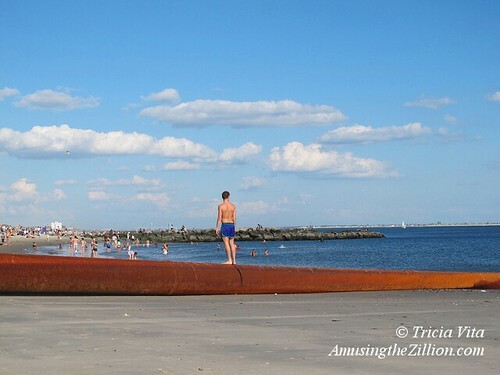 It was a gorgeous Sunday for walking on the Coney Island Boardwalk but what in the world was that tripod-like vehicle on the beach? We knew it had something to do with the US Army Corps of Engineers Post-Sandy Beach Replenishment Project currently underway, so we phoned their Public Affairs Department. Press Officer Chris Gardner says it is a CRAB aka Coastal Research Amphibious Buggy. This unique 18,000 lb. vehicle has a top speed of 2 mph on land and somewhat less in the water. Power is supplied by a 53-hp Volkswagen engine on the deck which drives a hydraulic pump. In the photo below that Gardner took on Friday, the CRAB is surveying a profile of the beach. You can see more photos from the set here. 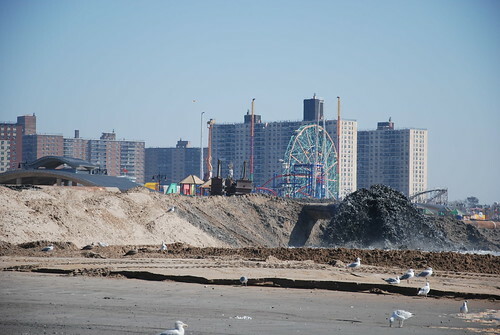 As ATZ reported earlier this month, the $7.2 million project to pump 600,000 cubic yards of sand along Coney Island’s shore began the weekend after Labor Day. 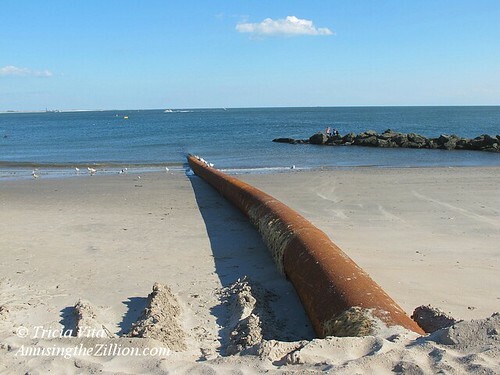 Approximately 272,000 cubic yards of sand is replacing sand lost during Hurricane Sandy and the remaining amount of sand is to restore the project area to its original design after 20 years of erosion. According to the USACE, the engineered beach is designed to act as a buffer and reduce risks to homes and businesses from coastal storms like Hurricane Sandy. The crews will be working non-stop for another 2 to 3 weeks in order to be finished before the hurricane season. 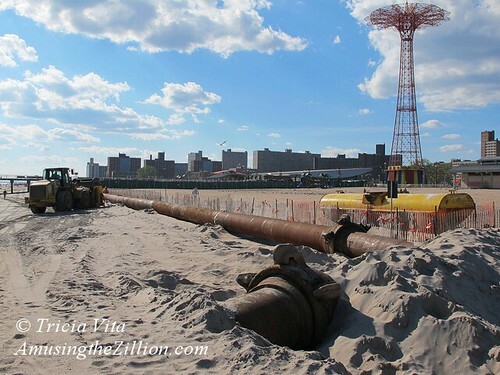 Over the weekend, work began on the $7.2 million project to pump 600,000 cubic yards of sand along Coney Island’s shore. ATZ snapped these photos on Sunday afternoon. Although the beach closed for the summer after Labor Day and red flags indicated no lifeguards were on duty, there were a few sunbathers and swimmers adjacent to the area where the work is getting underway. Check out our set on flickr. 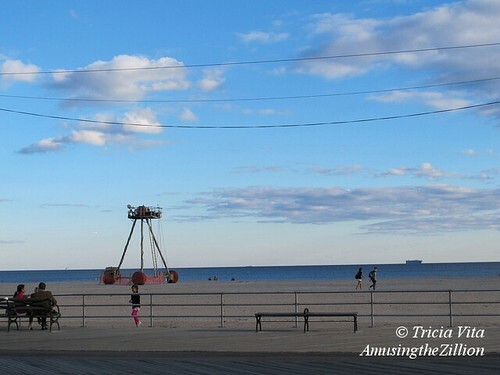 The annual Coney Island Kite Flying Festival, which was set for September 13-15 on the beach between West 10th and Stillwell, was cancelled by the Parks Department. While restoration work is going on, there will likely be rolling closures of roughly 1000 foot wide sections of the beach where construction work is active, according to a release from the Army Corps of Engineers. The beach nourishment project extends from West 37th Street to Brighton Beach, and is expected to be completed in the fall. 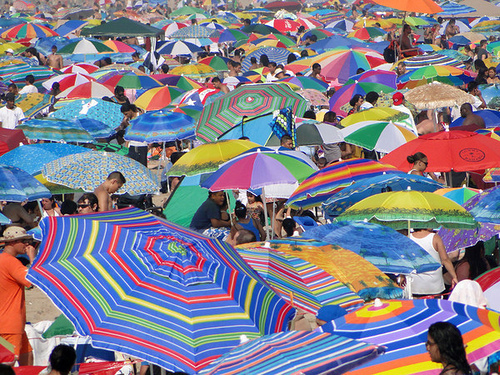 On the Fourth of July, Jim McDonnell took this amazing shot of Coney Island’s beach brimming with colorful umbrellas. Our first thought on seeing so many umbrellas was that it could be challenging to find one’s way back after a swim. “The 4th itself started out hazy but turned hot, humid and incredibly crowded!” says Jim, whose set of Coney Island Independence Day Weekend photos may be viewed here. 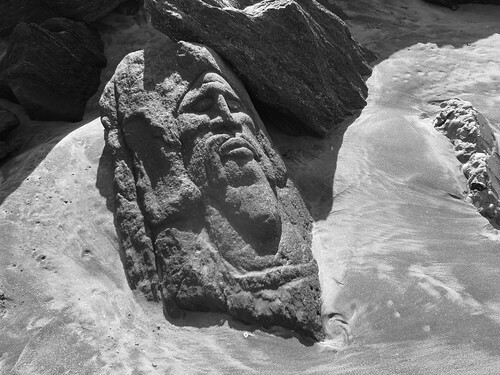 ATZ first learned of the existence of this stone face on Coney Island’s beach last spring via a tweeted photo. 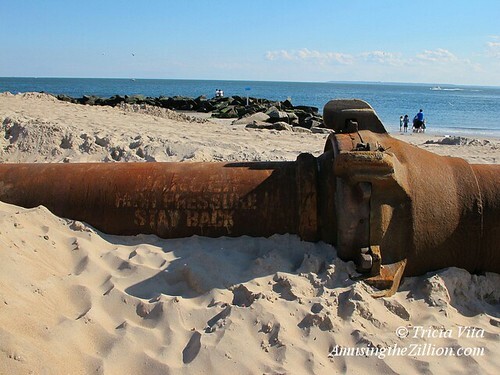 Since its exact location was not tweeted, we asked Coney Island resident and photographer Bruce Handy if he knew. After a summer-long search, Bruce finally found and photographed the Easter Island-like stone face carved into a rock on Coney Island’s beach! 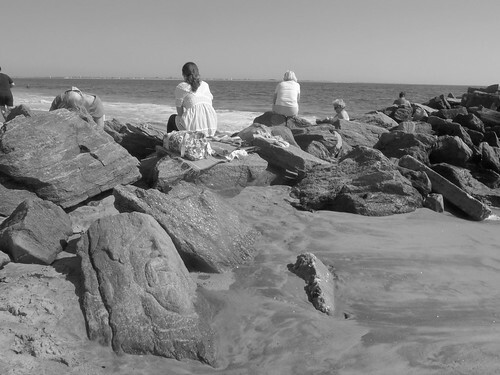 “I like how the people are laying on the rocks, unaware of the Easter Face,” he says. Can you guess the stone face’s location? 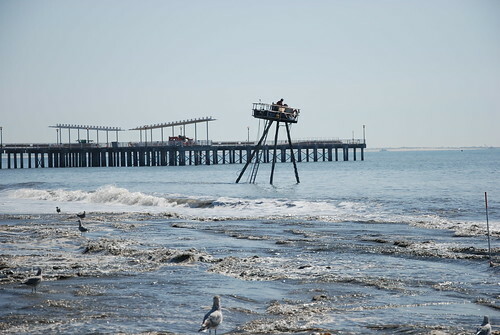 Hint: It is somewhere between Seagate and Brighton–all of which was Coney Island when Coney was an island. If anyone knows who carved the rock and when, please leave a comment below. Hey, maybe the Easter Islanders made a trip to Coney Island?! 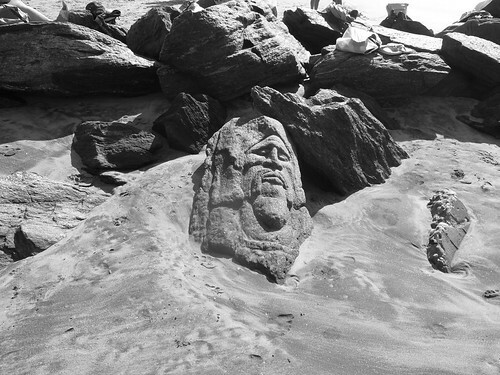 Or is it a depiction of Neptune, the god of the sea?